At the 7th Academy Awards held at the Biltmore Hotel in Los Angeles to honor the best films of 1934, It Happened One Night took Best Picture and swept the other top four categories, as well: Best Director, Best Actor, Best Actress, and Best Adapted Screenplay. Yep, Frank Capra, Clark Gable, Claudette Colbert, and Robert Riskin, respectively, had a critical and commercial hit on their hands. Riskin, by the way, was also nominated for four other films during his career: Lady for a Day, 1934; Mr. Deeds Goes to Town, 1937; You Can’t Take it with You, 1939; and Here Comes the Groom, 1952. 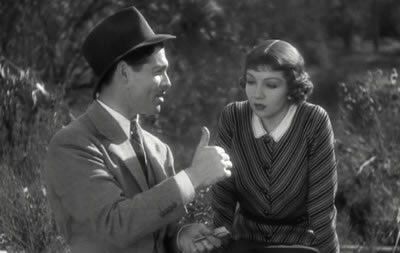 He deserves credit for such titillating dialogue between Gable as rogue reporter Peter Warne and Colbert as runaway heiress Ellie Andrews in the famous hitchhiking scene, after Elllie stops a car by showing her leg. Ellie Andrews: Aren’t you going to give me a little credit? Ellie Andrews: I proved once and for all that the limb is mightier than the thumb. Peter Warne: Why didn’t you take off all your clothes? You could have stopped forty cars. Ellie Andrews: Well, oooh, I’ll remember that when we need forty cars. Sarcasm works just as well today as it did back them. Not to make too big a deal of it, but it wasn’t until One Flew Over the Cuckoo’s Nest in 1975, followed by The Silence of the Lambs in 1991, that a movie again won in the top five categories. Will it happen this year? Maybe. American Hustle, based on an original screenplay scribed by Eric Warren Singer and David O. Russell, the later also the director, has nominations in the requisite categories. Great movie. Perhaps the year it was made, but this movie always reminded me of the great Cary Grant movie, The Awful Truth, with Irene Dunne. There are some very funny scenes in that as well. The scene where Cary and the piano teacher are hiding together and the scene where Irene is pretending to be Cary’s sister. Some very funny material there. 1934 – a very good year.